1. How would you like the pack divided? That's great Duna! This has been plaguing me ever since I began with the STS contracts, unfortunately my linux system has broken down so I am stuck with le Windows.. but I will make the changes to as many of the contracts as I can. I must get round to putting up a github repo to make things easier, but thanks a lot for finding out the duration issue! I think you deserve the bug finder of the year award! - Duna's fix for the durations. - Nightingale's isNotVessel parameter to stop vessels from being able to complete multiple contracts. - A search through some missions to try to preemptively find some bugs. - Maybe some completion messages? Enjoy in the meantime! I hope the bugs will become less frequent! This is just awsesome'! For KSP 1.04 im planning to do a full playthrough with your missions. The same goes for mods. What mods would you recommend to use for the best play experience ? Are thre required mods (like cacteye 2 for Hubble and so on ? )What tech tree would you recommend ? Does your tree generate enought science for using it solo or do i have to launche other non-mission-missions for science ? I like to play realisticly but also with fun and beyond the space travel we know can come up with. My idea of playing would be: Using the Seti Tech tree to start unmanned, then play your missions (start with V2 etc), after your missions go beyond that, first with comercial spaceflight like tourism (like in stock, deliver to sub orbit and station) then onward with the first Orion/mars missions (there is also a rover mission planned for 2016 and 2020 to mars). And after that try to colonise mars maybe (like mars one or the Zubrin concept). Also im plaing OPM and i wonder if it would be possible to make some missions for them, maybe like the mars missions. - Will you include some tourism like it is planned from Virgin galagtic or so ? - Will you include the future nasa missions to mars and other planets, and earth science satelites/ asteriod ? - Will you include rough concept missions like Mars one colony etc ? - Also would you be willing to build onto the Mars colony missions and make some for the OPM mod ? to colonize farther out ? What tech tree would you recommend ? i've just been giving myself 60 science at the start of a career, and then doing the "get science from kerbin" stock contract for the last five to let me start off with probes. science can be pretty sparse, if you don't allow yourself EVAs until you do contracts with them. I'm midway through Gemini, and missions requiring 3 crew are also difficult w/o the larger capsule. playing with RemoteTech makes the early Eve missions nearly impossible w/o the stronger dish, and returning unmanned capsules can also be a challenge! I'm guessing once I reach Apollo and can do science from Mun i'll be ok science-wise. So I'm having quite a good time with "open tree" fits perfect. Can I ask what the triggers for the missions are? I've just done the third mission (Soviet V2 recovery) and the 4th hasn't appeared in the available contracts yet. Will it only appear once I've researched an appropriate probe core, or is the issue perhaps that I have too many available contracts (if that's even an issue)? Can I ask what the triggers for the missions are? some contracts won't be offered until some time after the previous one was completed (early on this is typically 10 days). that's not the case here; you may just have to decline a few contracts before the new ones will be offered (due to mechanics in ContractConfigurator). i've started keeping my changes in GitHub, just so I can keep track of what I've fixed. Feel free to incorporate these fixes; I'll try not to push until I've actually verified the fixes work (which means I won't be updating RSS missions). notes = Launch an unmanned probe to the Mun. synopsis = Launch the Lunar-1 to the moon. description = Luna 1, also known as Mechta (Russian: ÃÅ“ÃÂµÃ‘â€¡Ã‘â€šÃÂ°, lit. : Dream), was the first spacecraft to reach the vicinity of the Earth's Moon, and the first spacecraft to be placed in heliocentric orbit. title = Flyby the moon. // Target body, defaulted from the contract if not supplied. Does this seem right ? The basic idea is to have a PARAMETER with a VesselParameterGroup wich defines the vessel and then later a PARAMETER with VessepParameterGroup2 wich asks for the same vessel. Hello everyone, been abit busy IRL as of late but I have uploaded a new version to Kerbal Stuff, this includes some of DunaDirects (Thanks! Duna, you have been mentioned in the acknowledgments and you can have a cameo as a passenger on whatever STS/Future ISS mission you like!) github fixes, some re balancing, a few spelling corrections and a land on runway requirement for X-15 and Shuttle ALT flights. The next version will (I promise this time) fix the cheaty complete two contracts in one issue (Its only been put off since this pretty much affects all 398 contracts) and also the duration fixes (again atleast 300 contracts). The next version will also have some more balancing and possibly some completion messages (yeah again.. all 398..) I will try my best though! I found the "FotonMissions" folder empty. Was this intentional ? Also the Sputnik Mission does not appear after the V2 20 mission. (i waited 4 ingame days). I have one other contract signed up (Take picture of the sun) could this lead to problems ? You successfully dock and exchange crew, and successfully recover Soyuz 4, completing the contract. Unfortunately, the second vessel experiences an anomaly during re-entry that results in loss of mission. But since you already completed Soyuz 4, you can no longer complete Soyuz 5! I'm going to give it a shot and it'll be on my github if i get it working. So I now started a new game and did not use any other contracts than your pack. So far there have been no glitches (i did not accept other contracts). But i noticed that you can get the Pioneer 1 mission earlier than the Sputnik 3 mission. For the sake of accuracy i would recommend/propose to order the flights like they occoured in real life.What do you think ? If my Lunar mission is working, can you add it to your repo. Also i think it would need a sperate Agency to run it but i dont know how to make one, so that it appears in the correct timeline. Sorry for the lack of replies and updates as of late, the weather here in the UK has been brilliant and I find it a shame to be sat inside coding As I have already said on my Orbital Decay mod I am just waiting for the next rainy day to do some serious work to both mods! In the mean time I would like to thank Duna for the invaluable help in his Github repo! @ManuxKerb, I have made the missions in chronological order based on agency so a certain agency set of contracts (e.g the Pioneer program) must be completed after its chronological predecessor (Sputnik-1), however this allows for missions to be progressed faster on some programs than in real life (For example later on, the soyuz missions along side the STS missions (Soyuz 1 - T-30 could be completed before launching STS-2) this is just so that people who want to only play a russian or american set of missions can do up to a certain point) the system I have at the moment causes issues with inter connectivity, so I will take your ordered flights idea into consideration when I release the individual and full packs. ( So basically I would have a purely chronological progression for the full pack and then no order limits on the separate packs (E.g the STS missions or the Apollo program). Sorry for not replying to your previous issue either, each contract has a cool down duration (Most are around 10 in game days) So you may have to wait a little while for new contracts to appear, If you don't see any new contracts after say 45 days then please let me know and I can have a look. By the way, some cool down durations are much longer for some Probe missions and the gaps after the wake of STS-51-L and STS-107 (due to the real life gaps). I think i found a bug with the explorer 1 mission. It does not get satisfied but all the reqirements are met (orbit above 70.000m). The strange thing is, that i got an succes popup that the mission was a success as it should be but it is not eradicated out of the contract window. It seems that the orbit condition is not prperly recognised. But in the space center, the contract is markedas done. Thankf for this truely great mod! This is almost always some sort of exception bringing the contract system down (and then when you change scenes it comes back up). If you can provide a KSP.log from when it occurred, then I can investigate further (or if you can reproduce it and get the log it would be even better). I get a lot of Exeptions about an old Distant Object version despite i have installed an update so this is currently spamming my log. Maybe that could be tha cause ? Hmmm, Distance Object Enhancement doesn't hit the contract system, so I'd guess it's not the issue - but I've seen stranger things, so it's not out of the question. But I found a nasty bug that caused my game to freeze, mostly when timewarping. I enabled verbose logging in Contract Configurator and found that before freezing it tried to create waypoints for Lunokhod-1 missions (side note: why? I dont even yet have any rover missions available). In all rover missions, at RANDOM_WAYPOINT_NEAR blocks, value for nearIndex = 1, while according to CC docs index should be zero based. So CC tries to create a new waypoint near to itself and ... freezes the game. So I just changed value to nearIndex = 0 for all rover missions, and now everything is fine. Hope it helps someone (I lost a lot of time trying to find the issue...). Thanks Xaegr, I've added some validation to Contract Configurator to throw an error for this. WhiteCat will have to update the contract pack still, of course. Thanks to all involved in the creation and maintenance of the pack; it is currently my driving force when playing KSP. Have you already considered adding the three successful US Vanguard missions? The first satellite launched, Vanguard 1, was the first to be solar powered, and though communications with it died in 1964 it remains the oldest human made object still in orbit today; even it's spend third stage rocket is still orbiting! I launched my own version of Vanguard 1 and intend to leave it in orbit for the remainder of my current game, even though my original Sputnik (or 'Kerputnik' as I called it) had a stable orbit, albeit with a periapsis almost down to 50km, which come to think of it might have caused it to burn up eventually, had I not manually deleted it already. EDIT: One further point; I just accidentally completed the mission to launch Explorer 1 by switching to flying my Vanguard 1 satellite. Perhaps on your next review of all contracts you could ensure they all have the 'must be new vessel' parameter where appropriate? Its been a while but I have just updated the pack, this update includes some separation of the pack into three main groups; this means that now everyone can play whichever mission within a reasonable amount of time (rather than completing 398 contracts!). The groups are currently 1940-1975, 1975-1998, 1998+. Some minor bugs have been found and fixed! Thanks for all the help everyone, I shall be updating to 1.4.0 soon, this will involve fixes for all 'Must be new vessel' requirements as just mentioned by gerishnakov along with fixes for Rover missions etc as previously mentioned in this thread. Bear with me and all will be fixed! However I would ask that testing of the pack as it is, especially the missions that no one has tried before (shuttle, mir, iss etc), be carried out before I update (since now I pretty much have to sift through almost 1000 files on each round of additions/fixes) so I want to fix everything (as best as I can) in one big go rather than do this again in a week or two! Since I do want to add more detail and substance to the existing missions and eventually more missions to the pack! P.S sorry if I have messages from anyone I have not replied to, I have been using a mobile for the last few weeks and messages don't like my phone! I will reply soon! Everything should now be playable, I will be correcting all contracts this afternoon for the IsNotVessel checks and some reputation balances so 1.4.0 may be out this evening or tomorrow! I have released version 1.3.3 which fixes issues in the X-15 and STS series, both should now be playable in RSS and Stock in the separate or full packs! 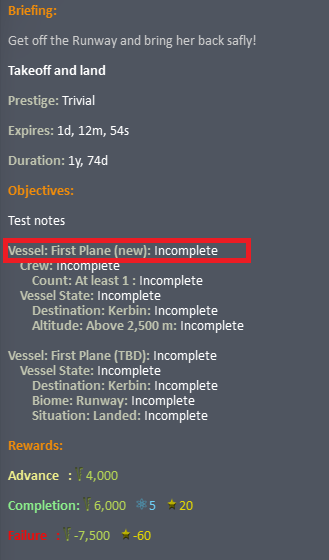 I have now released version 1.3.4 which includes the first round of vessel validation checks (So that a contract cannot be completed by a different contract vessel), these are a work in progress most should work, however I am unsure how these changes will effect some of the Soyuz missions (E.g some Salyut expeditions), If a contract becomes impossible to complete let me know and I will fix asap! I have released a new update which now includes all ISS expeditions and brings the total number of missions up to 440 but these missions are only included in the Full pack or the 1996+ sub pack for RSS or Stock Kerbin. I have also balanced some more contracts here and there so no more massive reputation gains (more to come). The next update will hopefully bring CKAN support and may include the Mars Program and or the Luna Program. Whitecat, did my response PM go through?